A good dual purpose variety but needing a warm location. 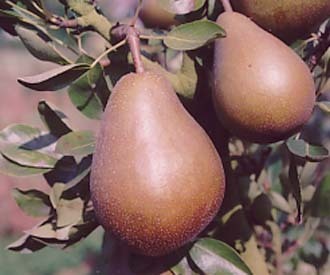 Beurre Clairgeau pear was raised by Pierre Clairgeau, Nantes, France c 1830. Large Conical fruit. Rough brownish yellow skin with orange-red flush and some brown russetting. Firm, white, granular flesh. Good sweet, musky flavour but needing a good summer to develop fully. Best grown in a warm sheltered position. Good for cooking. Compact, upright, hardy, tree. Heavy and reliably cropper.